Banaras Hindu University BHU UG, PG Entrance Test 2017- 18 are mentioned below. Online applications available from: 02- 02- 2017.
application form: 04- 03- 2017. Online Exam Admit card releasing date: April 2017. For SC/ ST is Rs. 250/-. duration is 120 minutes having 12 multiple choice questions. @www.bhuonline.in around 1 week before the entrance test. 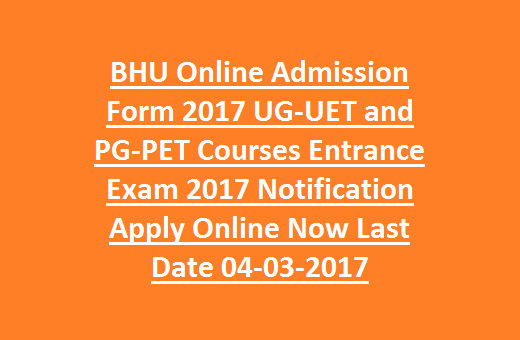 to know the updates of Exam Date, centers, Time and other details.
. Last date to submit online applications is 04 March 2017.
this BHU UET, PET 2017 see the official notification given below.